Selling for $32.98 0 1 Like this product? Direct From Farms, this Flowers are handpicked from "Platinum Line", guaranteeing the Highest Quality of Flowers Grown; a hand tied designed bouquet ready to drop into your vase. 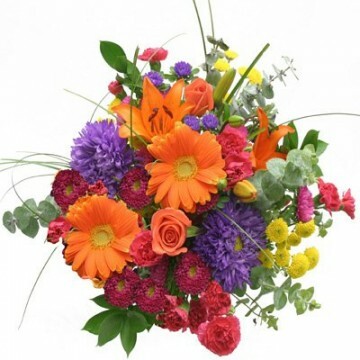 The flowers are absolutely fresh, lavish/plentiful, beautiful, with wonderful colors. A very wonderful gift for your loved ones. After reading prior reviews I felt confident about placing this order since people mentioned next day delivery. But I did it late in the day on a Friday (for a birthday the following Wednesday) and was perturbed to see the order wouldn't go out until the following week. Then I got an acknowledgement email that said it would not ship until Tuesday, with a two to six day delivery window, i.e., Thursday at the earliest. Sigh! To my amazed and more-than-pleased surprise, the flowers were actually delivered on Tuesday! According to my sister, they come direct from Honduras, Holland or Costa Rica ... hers came from Honduras. And that's the small part of this five-star rating. The flowers were absolutely fresh, lavish/plentiful, beautiful, with wonderful colors ... everyone in her office raved about them, with one woman able to specifically identify a special Honduran rose she was familiar with. The price is great, too, especially in view of what you get. I certainly know where I will be ordering flowers in the future. My sister, too. We're both completely thrilled and pleased. Ihave ordered these flowers several times, and never been disappointed. They arrive in perfect condiiton and have gotten nothing but compliments from the recipients! I've ordered from the other online flower sites before and am always disappointed in the quality you get for all the money you pay. Not at all the case with these flowers! I sent them to my best friend for her birthday and she said they were the most gorgeous flowers she's ever received! Very carefully packaged and delivered, the flowers arrived in top condition. The downside is that you can't specify shipping dates, but if that doesn't matter, just order a few days in advance or contact the company directly. The shipping is incredibly fast though, which worked out great! Beautiful flowers, great price, quick delivery....I'll definitely be a repeat customer!